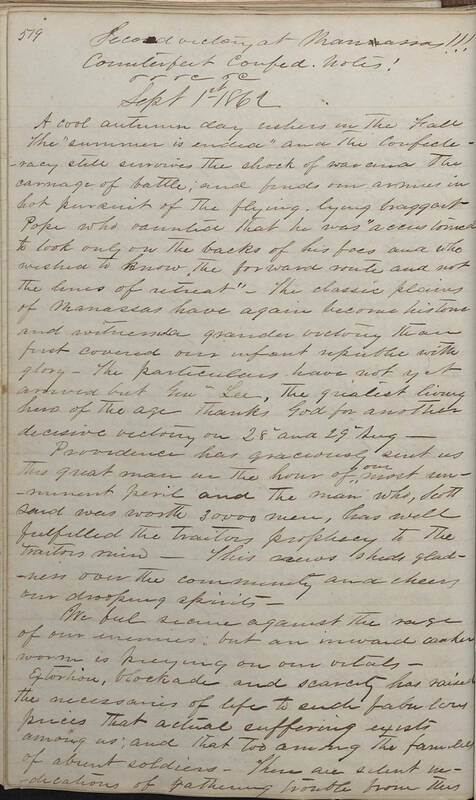 Item description: Entry, dated 1 September 1862, in the diary of David Schenck (1835-1902). David Schenck (1835-1902), son of a doctor and apothecary of Lincolnton, N.C., attended Judge Fearson’s Law School in Rockford, N.C., and received his law license in 1856. He was elected solicitor for Gaston County and set up a practice in Dallas, N.C., before marrying Sallie Wilfong Ramseur in 1859 and moving back to Lincolnton in 1860. Schenck was a member of the North Carolina Secession and an active participant in determining the conduct of the war. Exempted from army duty because of ill health, he held briefly a position in the Army Commissary Department at Raleigh. He then returned to Lincoln County, where he held the post of receiver under the Sequestration Act for the remainder of the war. In 1866, Schenck applied for a pardon and resumed his law practice. From 1866 to 1882, while he remained in Lincolnton practicing law, Schenck became involved for political reasons with the Ku-Klux Klan and continued, as he had done since 1858, his public support of national and state candidates of the Democratic Party. In 1874, he was elected Superior Court judge of the Ninth Judicial District of North Carolina and traveled on the court circuits in both Eastern and Western North Carolina, holding this position until 1882 when he went to Greensboro as general counsel for the Richmond and Danville Railroad. He was defeated in his campaign to be chief justice of the North Carolina Supreme Court. The last twenty years of Schenck’s life were spent in Greensboro, N.C., where he continued his law practice and became a prominent leader in civic activities. He was alderman, city commissioner, and founder and president of the Guilford Battleground Co. In 1895, his job with the railroad was terminated and, after this time, ill-health forced him to retire from law practice. A cool autumn day ushers in the Fall the “summer is ended” and the Confederacy still survives the shock of war and the carnage of battle, and finds our armies in hot pursuit of the flying, lying braggart Pope who vaunted that he was “accustomed to look only on the backs of his foes and who wished to know the forward route and not the lines of retreat”. The classic plains of Manassas have again become historic and witnessed a grander victory than first covered our infant republic with glory. The particulars have not yet arrived by Gen. Lee, the greatest living hero of the age thanks God for another decisive victory on 28th and 29th Aug.
Providence has graciously sent us this great man in the hour of our most imminent peril and the man who, Scott said was worth 30,000 men, has well fulfilled the traitors prophecy to the traitors ruin. This news sheds gladness over the community and cheers our drooping spirits. We feel secure against the rage of our enemies but an inward canker worm is preying on our vitals. Extortion, blockade and scarcity has raised the necessaries of life to such fabulous prices that actual suffering exists among us; and that too among the families of absent soldiers. There are silent [?] of [?] trouble from this some which makes patriots tremble. Another trouble has created a panic in commerce and unsettled trade__ An immense issue of counterfeit Confederate notes have been put afloat, of denomination of $20, 50 & 100. So well executed as to have found their way into all the Banks. They were sent South by the Yankees and sold at 4.00 per $100 worth and [?] principally in Atlanta, Georgia and were detected by parties paying immense prices for [?] and selling at less than cost. This gave rise to suspicion and detection. All the issue of the genuine have been called in by the Secty. Treasury. I am engaged these days in my duties as Receiver and have recently sold $20,000 worth of real estate confiscated in my district. Lands bring very high prices. Men who have money and do not wish to speculate, fear a depreciation and prefer to invest their funds in permanent property which cannot well be destroyed; and in fact the abundance of money depreciates it and correspondingly increases prices of good property. 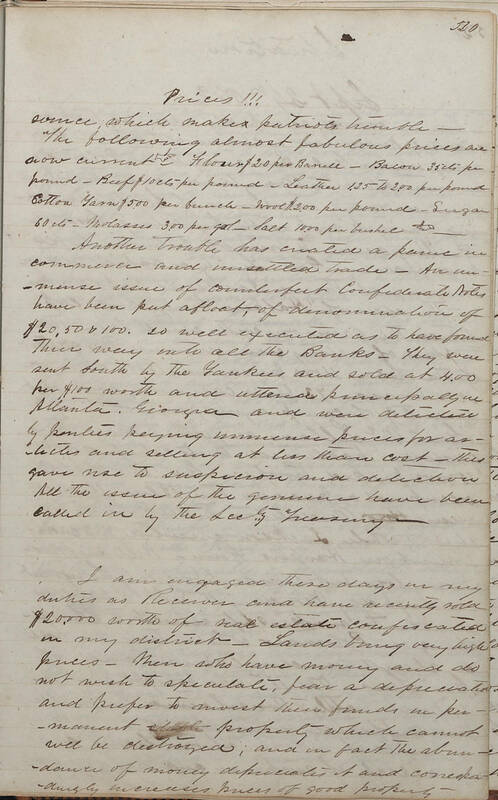 This entry was posted in Southern Historical Collection and tagged commodities prices, counterfeit currency, David Schenck, diaries, economic conditions, real estate, Second Battle of Bull Run, Second Battle of Manassas. Bookmark the permalink. Thanks for the post AND the great background information!